"Woodford Reserve isn't manufactured, it's hand crafted in small batches. This artisanal process allows us to craft it at all five sources of bourbon flavour giving it its distinct taste and crisp, clean finish." Woodford Reserve is classed as a Small Batch, Kentucky Straight Bourbon Whiskey and is currently under the ownership of the Brown-Forman Corporation. Woodford Reserve is also considered as one of the oldest Kentucky distilleries still operating, beginning production around 1780, it has seen its share of owners. A respite saw it in the mothballs for some time before then being repurchased by Brown-Forman and returning to production in 1993. 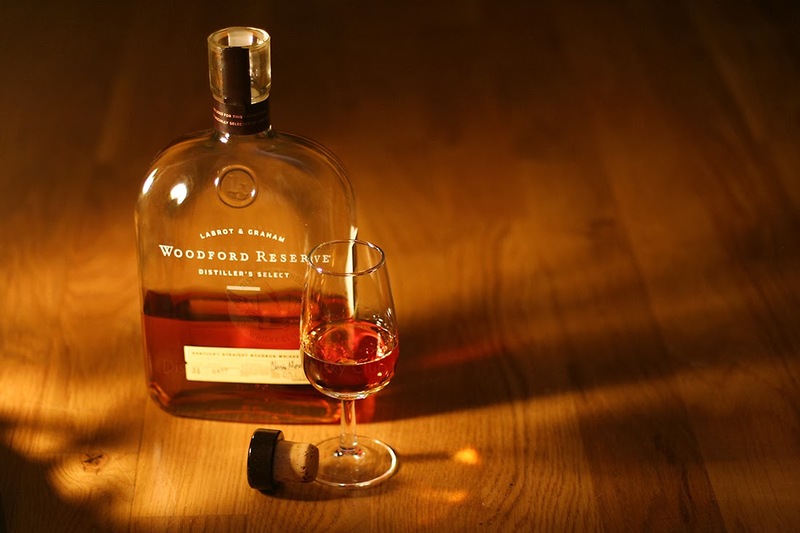 The distillery took on the name Woodford Reserve in 1996. At this time Woodford Reserve pretty much releases 3 specific whiskies: Woodford Reserve Distillers Select; Woodford Reserve Double Oak; Woodford Reserve Masters Collection. The bottle for the regular is iconic in itself but if you ever have the opportunity to own a bottle of the Masters Collection (which at this time I do) it is just as iconic, taking the form of a potstill reflecting the stills used to makes all Woodford Reserve whiskies today. I cannot recall ever trying the Double Oak but the opportunity is coming up very soon to do so and I am very excited about that indeed. To find out more about just how Woodford Reserve do things check out the official movie released. It is well made and give enough explanation without getting bored of the facts. Note the shape o f the pot stills imported from Scotland and the triple distillation process. Nose: Butter spice, sweet corn syrup, caramel oak. Taste: Full bodied with toasted cereals, honey, sweet corns and a rye hit on the tail to give it a balanced kick. The thickness it offers is very cushioning but not chewy like a full rye whiskey could be yet it still fills the mouth in the same manner. I even get the dusky dryness right on the tip that a rum develops but don't associate this in any way to a rum. Finish: Quite long and the heat of the spices returns developing a toasted almond scent and copper tang after the first dram. Overall the corn sticks and the mouth swells with the intensity of flavour making it an enriching whisky for the senses. Nothing to complain about as I am always happy to sip a Woodford Reserve on those balmy evenings. Look, this is a special kind of bourbon whisky no doubt, though some may find the sweetness a little over powering. Woodford Reserve claims their rye content of 18% is high for a bourbon, which it is, but the corn is prevalent through out which is understandable at 72%. Still the balance is good and they do retain a characteristic different from the other Bourbons potentially due to its triple distillation and pot stills. Also being small batch means slight variations each time but that is something I look forward to enjoying. If I was to give a dram then it would be 6 out of 7. Well worth the purchase especially if you want to impress your bourbon drinking associates with a touch of class.